Yesterday's Globe column focused on an e-commerce start-up called Kinset, co-founded by serial entrepreneur John Butler. John Butler is trying to introduce true browsing to the online shopping experience, blending the innovations of Amazon founder Jeff Bezos with the old-school merchandising of R.H. Macy. Butler is the founder and chief executive of Kinset Inc., a Marlborough start-up that plans to launch its first online stores this week. Kinset's stores combine e-commerce with the kind of visually rich, three-dimensional environment that has been made popular by the virtual world Second Life and such videogames as World of Warcraft, but that would feel familiar to a conventional department store shopper. In November, Brookstone will launch a Kinset store that will allow shoppers to roam virtual aisles in search of the perfect holiday gift. And Canton-based Tweeter, the consumer electronics chain, could have one online in time for the Su per Bowl, when buyers tend to hunt for new TVs. For those who appreciate historical allusions, RH Macy ran a dry goods store in Haverhill, MA (called the Haverhill Cheap Store), and even sponsored a parade in the town, before he moved to New York to start the shop that became Macy's. Interestingly, Macy was a die-hard entrepreneur: he failed four times before opening his store in Herald Square. More on that here. 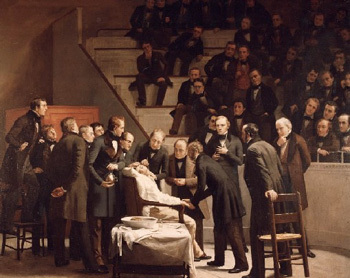 This Boston Globe piece is worth reading, even if only for the wonderful historical parallels: anesthesia was invented at Mass General Hospital in 1846, and more than 150 years later, researchers there are still working to make it better. Scientists at Harvard Medical School and Massachusetts General Hospital today described a new "targeted" approach to anesthesia that appears to totally block pain neurons, but doesn't cause the numbness or partial paralysis that is the unwelcome side-effect of anesthesia used for surgery performed on conscious patients. If approved for use in humans, the method could dramatically ease the trial of giving birth -- by sparing women pain while allowing them to physically participate in labor. It could also diminish the trauma of knee surgery, for instance, or the discomfort of getting one's molars drilled. Not only would there be no "ouch," there would be none of the sickening wooziness or loss of motor control that comes from standard forms of "local" anesthesia. Interesting tidbit: their approach relied in part on capsaicin, the ingredient that makes chili peppers hot.